The Smashville CLUB LADDER is an ongoing competition that produces a ranking list on our site. SEE BELOW – scroll down! We have brackets for Mens and Women’s singles and doubles as well as Mixed Doubles & Juniors. Ladder play on Thursday evenings 6:30 and Saturday afternoons (after kids training ) at 3:30-5:30. Smashville will supply shuttles for official ladder matches during these times only. Players are welcome to play off ladder challenges at other times, providing they have court access and their own shuttles. Non-members may compete at a $10. charge per matchday. SEPTEMBER is OPEN CHALLENGE month! After Sept. players may only challenge 3 rungs above your current level. New members get 1 open challenge. 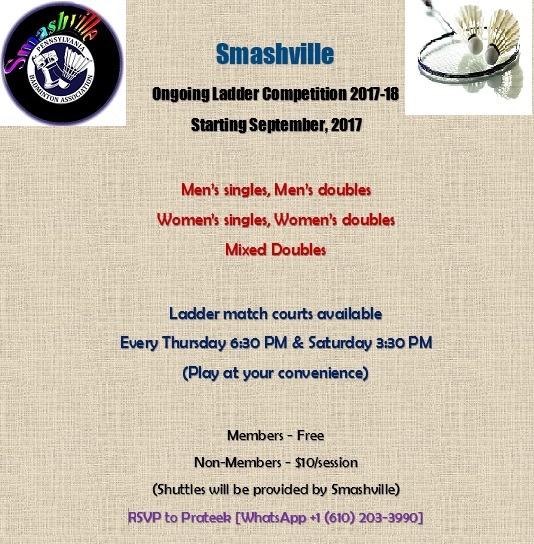 Match scores must be submitted to the Ladder Manager – Prateek immediately following each match ladder@smashville.us. A challenge must be accepted within 2 weeks (except in cases with extenuating circumstances e.g. trip to India, etc.). Following a loss, you cannot re-challenge that player/team until after 2 other ladder matches. 1. All ladder games on same day against same opponent count as 1 match. Total points determines winner of match. 2. All players agree BEFORE match starts if it counts for the ladder. 3. We use the official ladder match score sheet on clipboard for ladder scores, and all players initial the score following the match. 4. You cannot play same opponent in back to back Ladder matches. You have to play at least 2 other teams/opponent before a repeat match. Ranking points are calculated by JoomSport that takes into account wins, losses, and point differentials. All disputes shall be adjudicated by the ranking committee. Links to the Ladder ranking pages and stats will be posted here. Singles has started! We currently previewing the singles ladder below on this page!